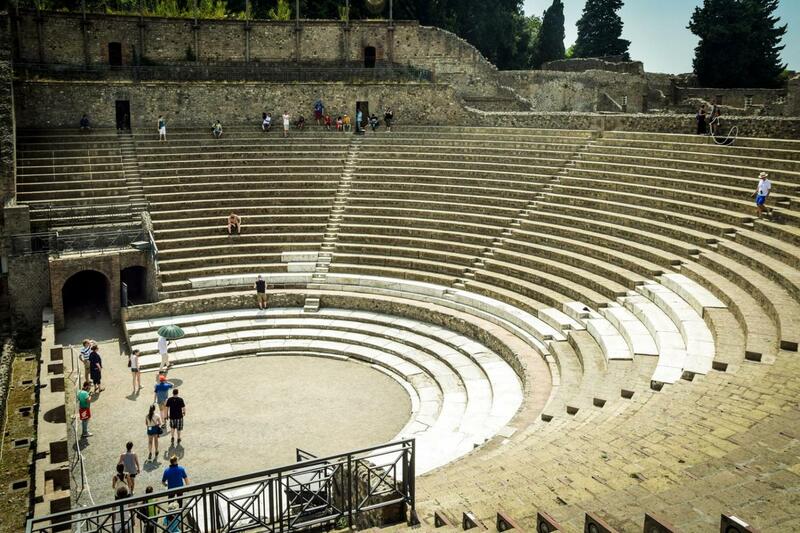 Explore Pompeii, a UNESCO site, on this guided day trip from Rome. Upon arrival, skip-the-line to explore the marvelous Roman architecture right away! This activity starts at 7:30 am. The tour is available in English, Spanish and German. French is available from April to October. The pickup service from your hotel is included, please call 24 hours before the tour starts to receive your pickup time and please be ready in your hotel lobby 10 minutes prior to assigned pickup time. If your hotel or accommodation is not served you must reach the Gray Line-I Love Rome office in via Vittorio Emanuele Orlando 95, opposite the Grand Hotel (Metro A Line, Repubblica stop) at least 30 minutes before the tour starts. Join us on this amazing journey through space and time, entering Pompeii: a unique document of Greco-Roman life. We will begin our journey along the Highway of the Sun, driving past the famous Roman countryside, the Castelli Romani. Admire an incredible views of the Mediterranean and Mount Vesuvius, as well as to countless historic sites. You will enjoy a short sight of the City, the seashore and the Gulf of Naples. The first stop is Naples, one of the most enchanting cities in the Mediterranean famous worldwide for its rich history, art, culture and gastronomy, where you will take a short panoramic tour to discover its beauty from the comfort of your coach climbing up the Vomero hill. The town overlooks the bay of Naples which extends from the Sorrento peninsula to vulcanic area of Phlegrean fields, and the skyline is dominated by the majestic and still active volcano Vesuvius, offering an impressive sight perfect to take stunning pictures. Descending towards the port of Mergellina, you will leave the city and travel south towards Mount Vesuvius and, once you reach the town of Pompeii, you will have the chance to enjoy lunch with a real Neapolitan pizza! After stopping for a traditional Pizza lunch, we will make our way to the UNESCO Archaeological Site of Pompeii with skip-the-line tickets. We will spend the afternoon exploring this once thriving city that was frozen in time by layers of volcanic ash. Pompeii remained buried under a layer of pumice stones and ash 19 to 23 feet (6 to 7 meters) deep. The city’s sudden burial served to protect it for the next 17 centuries from vandalism, looting and the destructive effects of climate and heavy weather. After the tour of Pompeii, we will resume our trip through the Roman countryside, enjoying the scenery as we leisurely make our way back to Rome. Return in time to enjoy the rest of the night in Rome at your leisure. 6:30 am - Hotel pickups begin. We had an amazing day , from the driver to our lady who was on the couch with us who was very professional friendly and helpful, the guide who joined us then walked round Pompeii giving us all the facts and information was a truly unique experience. It sounds as though our team gave you a great experience in Pompeii! We are so glad you joined us for this tour, and we hope you have an amazing new year. The guide was very knowledgeable.